The McKinsey and Company report “Driving Sustainable Growth for Thoroughbred Racing and Breeding” totally misses the mark when it comes to figuring out the customer, and figuring out how to grow the customer base. So though not totally worthless, the report is nothing that will save the game, perhaps throw a few band aids on it, but that is about it. And really, there is nothing new there at all, other than some stats that just confirm what most insiders already know. The report seems to put the horse owner ahead of the customer. Big mistake. The industry shouldn't focus on what is good for the owner, but what is good for the customer (the gambler). The more Horseplayers, the bigger the purses, the more horse owners. That is how it works. The report acknowledged that 26% of core bettors consider pari-mutuel takeout a “top two concern,” but fewer than 2% of most fans know about takeout. Thus, the report makes no recommendations on an issue that has boiled over this year, particularly in California. 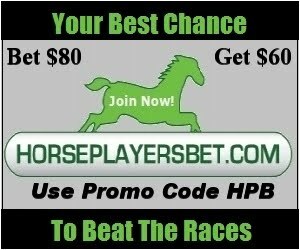 “We prefer rebates as the method to address the price-sensitive bettor,” Singer said. When it comes to growth, it really doesn't matter what existing customers like. They aren't the big problem as Pull The Pocket points out. Price sensitive players are already getting rebates for the most part. If slot players were given a similar survey, about 0% of the core players and casual players alike would state that house take was a major concern. However, it doesn't mean that slots charge a ridiculously high take (it is around 5-8% in most jurisdictions). Slots operate at something called an optimal takeout. A percentage that holds players attention the most so that they will lose the most money in the long run....not short run. A percentage that gives the player the illusion the game is beatable and/or they can get a good deal of enjoyment over time on average to keep their high going, and keep them wanting more after they leave the joint. Horse racing operates in a way where they take as much money as possible whenever they can. The takeout is so high, that there is no chance to beat the game long term without substantial rebates, and the fact there are virtually no visible winners, makes it near impossible to attract new generations, like poker did. The study failed to address this, instead focusing on trying to lure players by just teaching them to bet. Silliness. There has to be a reason for a newbie to get involved in the steep learning curve of horse racing handicapping. We need visible winners. We need lower takeouts. But all major metrics have fallen since 2000, the study notes. Betting handle is down by 37 percent, attendance at tracks is down by 30 percent, starts per horse and race days are both down by 14 percent. If these trends continue, the findings say thoroughbred racing will lose fans at a rate of 4 percent a year. Every year, the study said, 2 percent of fans die, 5 percent lapse and only 3 percent are newly attracted. If this trend persists, by 2020 the fan base will be only 64 percent of what it was in 2010. I'll state it again. Horse racing is missing out on a fantastic opportunity right now with the closing of many poker sites in the US. Gamblers are itching for action, but they want to play a game that is at least perceived beatable by some. Great idea. In fact, Gural have he may have got that from me. Unfortunately for thoroughbred fans, Gural is only talking harness here, and only talking three tracks. No mention of broodmares. I think it is important that they don't stop racing too quickly either. The two good things that will come from this for either harness or thoroughbred horses, is that good horses will have careers that can be followed longer, and it gives them a chance to develop a larger fan base, and secondly, it will lead to horses being bred for longevity instead of being bred to be a shooting star. Two harness stories in a row, well they could be thoroughbred stories just the same, as the issues overlap in both industries. Pena was barred for winning way way way too much. The controversy here is that whatever he is allegedly using to improve horses so drastically has not been found. Tracks are private property, so one can be guilty until proven innocent. But this line of rule is hardly used. "Lou Pena has this sport figured out. He knew the exact right speed to jog his horses thru the week. He figured out the exact right amount of hay and oats to feed his horses on a daily basis. He probably also knew the exact right amount of water to let them drink every day. This was pure genius on his part, no other trainer on the planet has been able to crack this formula and step up horses like they were given rocket fuel. No it is all technique." The reality here is that both the thoroughbred and standardbred game doesn't do enough to deter cheating. Trainers get a slap on the wrist usually when caught. How about making cheating a criminal offense. Kinda like the riots in Britain, if I was vandalizing a business, I'd expect to be shot at, and until a couple of youths are shot or hurt real bad, there is nothing to stop it. Super trainers are bad for the game. They not only create races that many handicappers won't play, but they also deter new owners from entering the game (if you are up against cheaters, you are mainly running for third or fourth money). Del Mar's handle is shrinking (doesn't seem to be the economy judging by Saratoga's results so far), and the tracks want to reduce the takeout on at least a couple of exotics but the TOC isn't too into it. As long as the purses are artificially? higher, the horsemen have no urgency to do the right thing. But since the deal that was made last year which winds up giving the horsemen a higher percentage of what is bet, handle has fallen, and it is the tracks that have been getting clobbered. This is unsustainable, and the tracks know it. The horsemen may know it too, but until they are faced with purse cuts or date cuts, they will probably tend to stay away from fair negotiations regarding the future. The Players Boycott is hurting them too. Probably not as much as they think, though I know at least 5 players who won't even open up California past performances, and my guess is that there are probably a lot more. No, the decrease in handle has more to do with increased signal fees and takeout which create a lot less plays for value bettors, which causes them to be pickier and play less. Secondly, those who cash tickets are getting back less, and have less to churn with. This phenomenon gets only will get worse, as these players who don't last as long as they used to have less urgency in coming back to the track as often, and some actually quit over time. As for the Players Boycott's effectiveness, well how many tracks have increased takeout since California decided to? NONE! How many have lowered takeout on at least one wager? Lots. Even Parx and Penn have got into the action of reducing takeouts. The Boycott is good for Horseplayers, and that means it is good for horse racing's future. Is this a leading indicator that the economy is about to rebound? How come we aren't seeing the same thing in horse racing? Maybe it has a lot to do with the US government coming down hard on online poker. These players need to go somewhere, they are after all gamblers. Too bad horse racing doesn't have the visible winners poker did. Oh wait, the takeout is too damn high for that to happen. There is very good reason to believe that some online poker players are actually getting their feet wet in online horse racing now. Again, the fact they won't last very long means that racing is missing a golden opportunity right now. And the learning curve is very steep as well. The online poker players willing to give horse racing a shot though are probably smart enough to get started at ADWs that give rebates, as they are by nature, very price conscious. This fact may help cultivate the odd player into a long term Horseplayer. The industry can only hope.